Petite Sirah is absolutely delicious—related to the true Syrah of the Rhone Valley. 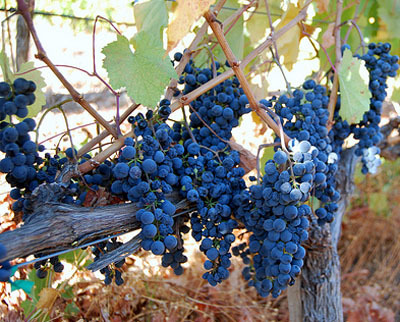 DNA studies show that Petite Sirah is the Rhône grape Durif, which is a cross between the Peloursin and Syrah grapes. Petite Sirah is now predominantly planted in California, where the grape grows very well in that climate. Some of the Petite Sirah vineyards in California are very old, much like the old vines of Zinfandel. Taste notes include plum, raspberry, blackberries, and black pepper. This is a great wine for decanting, and pairs well with game, beef, lamb, and spicy sauces. Petite Sirah can be enjoyed fresh from the bottle or aged for a softer flavor; its high tannin content makes long aging worthwhile. Prices range from $15 to $50, and upward. Petite Sirah recommendations: Charter Oak Winery, Chiarello Family Vineyards, Concannon Vineyard, Foppiano Vineyards, Frank Family Vineyards, Frog’s Leap Winery, Keplinger Sumo, Louis M Martini, Markham Vineyards, Olabisi Winery, Parducci, Robert Foley Vineyards, Spellbound, Stags Leap Winery and Switchback Ridge. 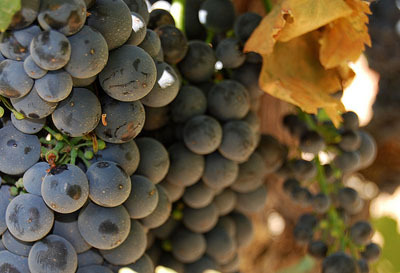 Petit Verdot, equally delicious, is one of the six original grapes of Bordeaux and has been used often in Cabernet Sauvignon, Merlot, and most Bordeaux style wines as a blending grape. Petit Verdot ripens very late, requiring lots of sun and heat. It is an intriguing grape, and now doing well on its own as a single varietal, especially in Napa Valley. Petit Verdot with its inky color, imparts flavors of dark fruits—blackberry, raspberry, cherry and plum. There are hints of clove and pepper—velvety rich and luxurious. This wine is best served with food, especially hearty wintry dishes. Petit Verdot can be hard to find, but worth the search. Prices range from $30 and up. Monty and Sara Preiser, the founders and publishers of The Preiser Key, are a great resource, and during my recent visit to Napa Valley, we had small tastes of many Petit Verdot wines. For information and locations with detailed maps of wineries in Napa Valley, the Preiser Key is free and easy to find when traveling in and around Napa Valley. Petit Verdot recommendations: Anderson’s Conn Valley, Ballentine Vineyards, Bell Wine Cellars, Ferrari Carano, Frazier, Heitz Cellar, James Cole, Jarvis (half size bottles only), Lange Twins, Rutherford Hill Winery, Trahan Winery, Trinchero Napa Valley, Truchard Vineyards, and William Hill Estate. While on the subject of “petite” wines, another option is half bottles of varietals, more popular now than ever. Of course, half bottles are less expensive than buying a full bottle, and you drink less alcohol. They are great for sampling new wines and for gift giving. Fontanfredda, one of the largest wine companies in Italy, recently released Volumi Ballati “The Perfect Serve”, appealing to people who dine in smaller groups and are drinking less wine, but still looking for high quality and flavor. The wines are eco-friendly, as the bottles are made from 85% recycled glass. Choices include Roero Arneis, Serralunga D’Alba Barolo, Piemonte Barbera, Dolcetto and Nebbiolo. Another way to taste new wines is to sample “petite” half glasses that many wine bars and some restaurants are featuring. This is a perfect way to try more than one wine without consuming too much or running up a large tab. Wine flights are a nice way to experience new wines and to increase an understanding of a specific region, vintage, or grape varietal. Wine festivals are also wonderful opportunities to sample various wines. Be sure to ask for “The Petites, please” at your favorite restaurant, wine retailer, the wine events happening in your area, or on a trip to California wine country. Cheers!